This is the spring 2014 Second Life statistics update blog post. I publish the spring, summer, autumn and winter updates during each year looking at the Second Life economy. My last Second Life statistics blog post was published on 2nd December 2013 for the winter update. Since 2nd December 2013 the region count is still declining week on week and Tyche Shepherd published today that Private Estate Net loss for the year to date is 92 regions (0.5%). 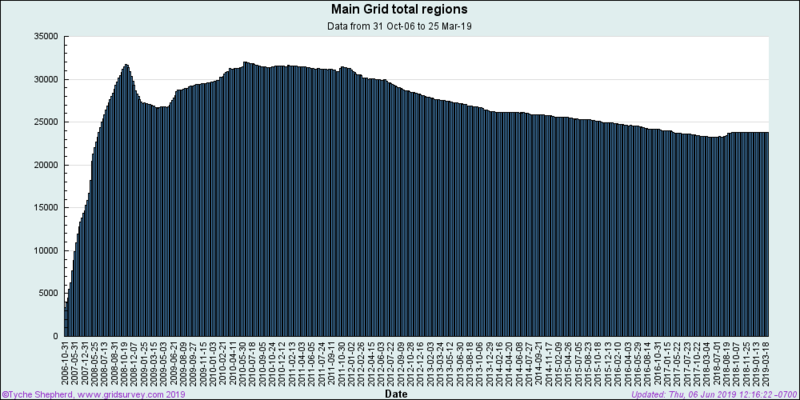 If rates continue then the total number of main grid regions will go under 26, 000 within the next few months. Private Estates will go under 19, 000 within the same time frame. On 24th February 2014 private estates actually grew by 15 regions (net growth) which was welcomed I think. 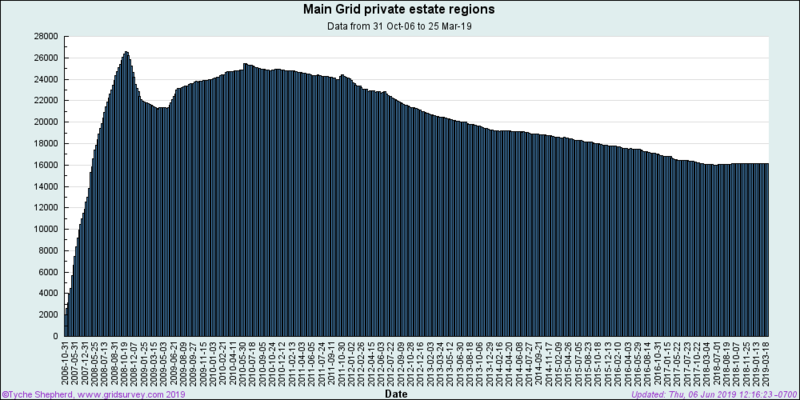 This marked the first growth for private estates of 2014 and marked the first time the grid grew week on week since 31st March 2013. These are positive signs indeed that there is interest again and growth for private estates in Second Life. It would be nice to see private estates growing on a monthly basis instead of slowly declining. The good news is that there is a slow down in net losses which is good and lets hope it continues to slow down. It would be nice to see growth in the total amount of regions in Second Life again. 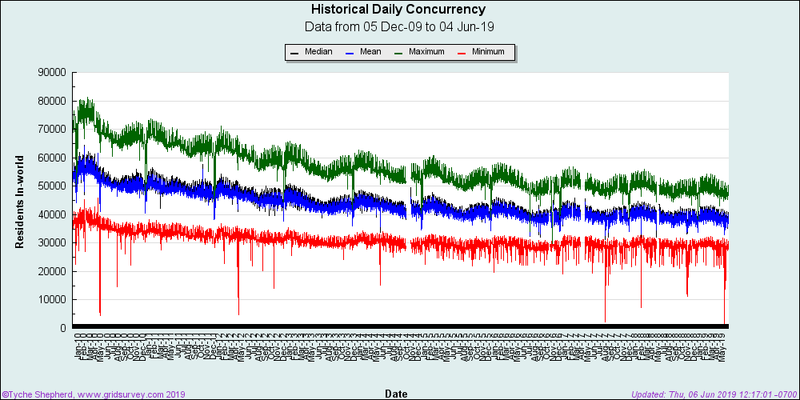 Since December 2013 the daily concurrency levels seem to be reaching a maximum peak of 62, 000 on average and 29, 000 for the low peak. The median and mean daily concurrency seems to be steady around the 45, 000 mark. As of today there are 37,524,063 total signups since Second Life first launched according to the Second Life Grid Survey. 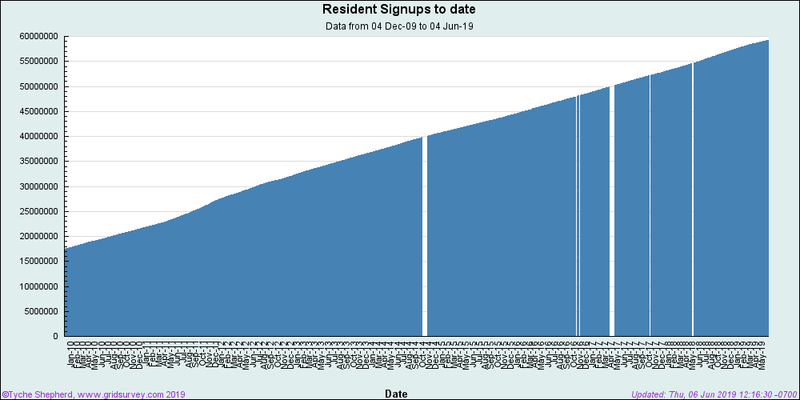 See the updated graph below showing resident signups to date and it appears there was more growth in signups from late 2011 onwards. Hmm, interesting! According to Dwell On It statistical graphs it appears that the rate of signups on a daily basis is now between 7, 000 to 14, 000. Within the next few years the total amount of signups will reach 40, 000, 000. I hope the daily signups rate will increase in the coming years to something like 15, 000 to 20, 000. I think that with more investment in new developments for Second Life that will happen at some point. On 15th March 2014 Hypergrid Business reported that OpenSim regions drop on OSgrid’s spring cleanup. The top 40 OpenSim grids lost nearly 5, 000 regions during the last two months. 196 opensim grids reported stats last month and note that there are far more opensim grids out there but they didn’t share stats. My next Second Life statistics blog post will be published in early July 2014. Check out my SL Metrics page for more interesting stats. What’s your take on the theory, advanced by Pussycat Catnap last year, that the unusually high number of registrations actually come from forum spambots trying to post on the Lithium community platform used by LL (which spammers know that must have large communities, since it’s an expensive platform)? This would both explain the huge number of registrations as well as why almost none of them are seen in-world — and would have absolutely nothing to do with Second Life’s perceived ability to attract people, but having a too-tough UI and high learning curve? Hey Gwyneth and thanks for your comment. That may be true or not but the problem is that new signups don’t stay that long in Second Life and that needs to change. I think the new user experience needs another revamp with mentors/volunteering helping like the old days which may make a difference. Yeah I think there is alot to take in all at once upon first login and perhaps that could change with tutorials/pointers. Since December 2013 there seems to be a slowdown happening with Second Life and now with OpenSim grids. Perhaps this year is when things start to balance out in terms of the numbers. It’s a Buyer’s market, not a Seller’s market!